The marching season has got off to a splendid start with Istanbul Pride throwing down the gauntlet with tens of thousands of people (some reports suggested 60,000) parading along Istiklal Caddesi, Istanbul’s main thoroughfare. This is where Istanbulers come to meet, drink, shop, party and demonstrate. The brave souls carried a giant rainbow flag and, in an unprecedented show of unity, held banners demanding justice and LGBT rights in Turkish, Kurdish, Armenian and Arabic. 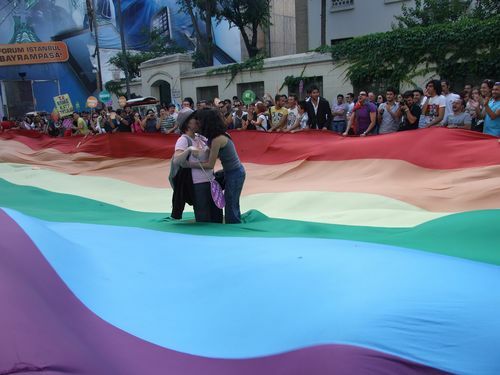 And for the first time there were also Pride marches in Izmir and Antalya. One of the most popular slogans was “Where are you, my dear? Here I am, darling!” Will the increasingly repressive Turkish Government led by the dour and autocratic Erdoğan listen? Probably not. But, following hot on the heels of the vicious crackdown of the Gezi Park protest, Istanbul Pride goes to prove that it ain’t over ‘till the fat drag queen sings. Looked liked a fantastic day. We’re sorry we missed it.